Saverio Roberti, a Roman lawyer, at the instigation of his eldest daughter Olimpia, in 2002 decided to move with the whole family to the estate acquired in the 70s in Montepulciano. 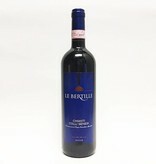 Today the estate is composed of two Poderi, Le Bertille and Casella: 20 total hectares of which 14 are vineyards. The cultivated varieties are cherry, colorino, mammolo, canaiolo, gentile blackthorn (the Sangiovese cultivated in Montepulciano) and merlot and petit verdot.